In the furthest south-east of Cuba lays the country’s second city and old colonial capital – Santiago de Cuba . There are a number of hotels and resorts along the coast, many of them either bad and run-down or very bad and touristy. The best beach at ANY resort in Santiago de Cuba is the Club Bucanero 25km south-east of Santiago with all mod-cons for $60-120pn. By far the second best place in Santiago de Cuba is the Villa Gaviota Santiago de Cuba, a 20 minute drive from Santiago on the Reserve El Indio nature reserve. There are two sections to the hotel: further from the beach are motel style buildings in woods; close to the small, sandy cove are cabanas with porches and rocking chairs – specify one of these when booking or on arrival. There is also a small pool by the shore. $30-50pn – the food is better than most, though overpriced. 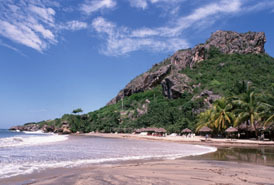 Take the road fromSantiago de Cuba, east to Siboney Beach. On the way, you will pass 26 white monuments in memory of the heroes who gave their lives during the attack on the Moncada Barracks with Castro. At the “farm”, where the attack was planned, you will see a museum display of the plan of attack, including the weapons.